Most people who attended NNA 2014 Conference in Phoenix, Arizona, were looking for ways to advance their careers. 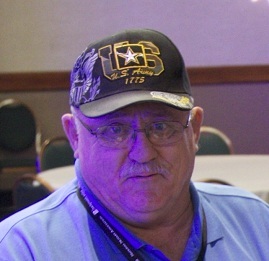 But veteran Mike Tillotson came in the hopes of finding a new way to help homeless and needy veterans by taking advantage of the complimentary one-day Conference pass for veterans, sponsored by the National Notary Foundation. As a Peer Support Specialist with the Community Resource & Referral Center in Phoenix, Tillotson serves on the frontlines of his city’s homeless epidemic, finding veterans in need and helping connect them with them with critical services and resources. Tillotson said that vets he helps often need documents notarized but have a hard time finding a Notary. So he is working to become one, and attending training at NNA 2014 was the first step. While at the Conference, he was pleasantly surprised to be able to connect and share information with dozens of other vets who were ready and willing to help with his work. And that work is his passion. On an average day, Tillotson will spend hours scouring the city in search of those in need. Sometimes he finds them standing on street corners and alleys; other times he finds them sleeping at dried river bottoms and living in the dark tunnels beneath freeway overpasses — places all too many veterans call home. Many of his clients also battle substance addictions. As a recovering alcoholic and drug addict himself, Tillotson can relate to those still suffering. Tillotson helps vets get transitional housing and temporary financial assistance. He also connects clients with viable job opportunities. Becoming a Notary will help Tillotson offer even more. “Many of these guys don’t even have the money to pay a Notary,” says Tillotson. As one of the over 100 veterans who registered for NNA 2014, Tillotson was able to pick and choose the training he wanted. Since then, he has connected with a Notary mentor in his area who is willing to help guide him along that path.